In Sydney, celebrations this year are designed to be a lot greener and far more Australian as compared to the previous years. 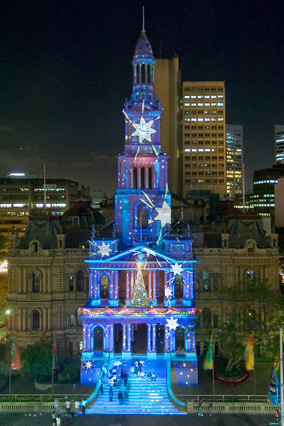 The projections on the Town Hall building will feature images that are uniquely native. The impressive facade of the Victorian sandstone building will reflect images that are exclusively and expressly Australian. The images will include those of wattle blossoms, kookaburras, blue bottles, flying foxes, echidnas, sailing yachts, blue-tongued lizards, parks, King Parrots, bottle brushes, a pink galah in a gum tree and diverse cultures of Australia – iconic Australian images that will give the Christmas celebrations a remarkable Sydney or Australian flavour! 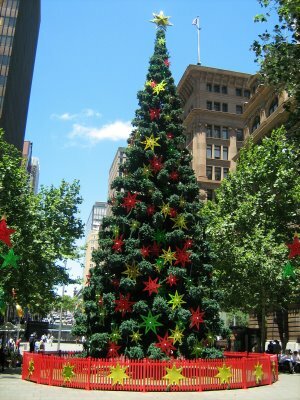 In addition to the 21-metre giant-size Christmas tree at Martin Place, there is an 8-metre tree at Taylor Square and several other Christmas trees at several other locations. In view of enhanced sustainability, all light decorations will be powered by GreenPower. The fireworks also make use of green explosives causing minimum harm to the people and the environment! The Christmas Concert venues give out a clear message of sustainability! School students’ display of their little gardens in garden boxes, as part of Live Green School Garden Project, will pass on a healthy message on the green methods of growing plants and preparing food. And as a frosting on the Christmas cake, all decorations will be of a reusable nature!